Contrary to what many may believe, there is some major “green” progress being made in Kansas. Johnson County Wastewater (JCW), responsible for the collection, transportation and treatment of wastewater for more than 90,000 properties and about 440,000 people, is breaking ground with an exciting new cogeneration project. 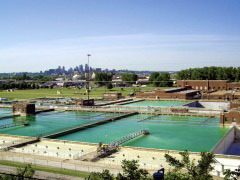 By collecting the methane gas from the digestion of restaurant fats, oil and grease, JCW is generating enough electricity to run half of the Douglas L. Smith Middle Basin Treatment Facility thereby saving almost $250,000 a year with on-site power generation. The National Environmental Health Association’s Sustainability Award, which recognizes environmentally significant organizations, businesses, associations and individuals, was recently and justifiably given to JCW for being such a beacon of sustainability. Of course, awards are somewhat meaningless when measured against the rewards of progress. For example, we’ll give out our first honorary Bionomic Fuel Award right now to JCW. We don’t have a plaque or a trophy to hand out, but we mean it just as sincerely. Our unofficial award aims to underline the creative ingenuity of this cogeneration project over the illustrious partnerships or the money saved. Posted on September 16th under Pollution Reduction.